Running a dynamic event and a heart event on my Asura Warrior during the final beta weekend. The heart vendor sells a greatsword with an icy glow that is the exact weapon that the nearby Jotun (frost giants) use. The great thing is, thanks to transmutation stones you can get in the game, I can keep the look of this all the way up to max level and beyond by combining the look of this weapon with the stats of another. I recorded this world boss fight in the middle of the HUGE PvP zone called World Versus World… a two week long battle between servers. Keep assaults, tower sieges, and random world bosses… Totally unexpected. I had explored the Collapsed Observatory earlier in a previous Stress Test. There is an article about my experiences here on the site. During Beta Weekend #2 I decided to return to get some video of it. Hope you enjoy it! 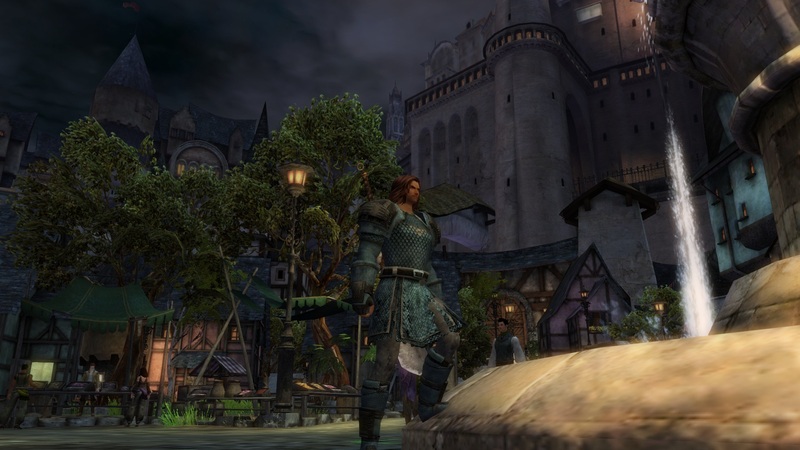 I had another chance to get some hands on time with Guild Wars 2 during Monday’s stress test. From 11am till 6pm PST, ArenaNet opened the servers once more and allowed us to play the same characters and the same build as the previous beta weekend. My plan was to cram as much structured PvP as possible into the afternoon, but as I wasn’t able to queue up for the first twenty minutes of the stress test, I decided to move on to Plan B. Plan B ended up being so much fun, I never made it back to The Mists. It may not seem like much, but the way your character model will account for things like uneven terrain are very nice touches. I started off running around Divinity’s Reach, just getting a feel for the city and trying to do a better job of capturing its look. One of the main things I love about Guild Wars 2 is the simple pleasure of wandering around a city, overhearing NPC conversations and exploring its streets and buildings. I find myself getting the same sense of wonder and curiosity as I do when I travel abroad in the real world. While the skyline of Divinity’s Reach is certainly impressive, what blows me away is just how dense it is, and how its streets and alleyways look lifelike and natural. In other MMOs I’ve played, the cities are often laid out in a very simplistic and artificial way. They remind me of the old maps I used to make as a novice Dungeon Master for Dungeons & Dragons. Each of the spaces I designed all fit perfectly within the square block guidelines of my graph paper. They were functional, but sterile and artificial. In Guild Wars 2, cities like Divinity’s Reach and Lion’s Arch have a very organic look to them much like real cities do. There may be trade districts, but you’ll often find vendors in various areas of the city, seemingly running booths out of whatever space they could find. The alleyways, side streets and dead ends all imply a very natural imperfection – the kind that happens when you take an idea and add the chaos of real people into the mix. After Divinity’s Reach, I decided to move on to Lion’s Arch and see a few more wonders of the world that I missed during the first beta weekend. 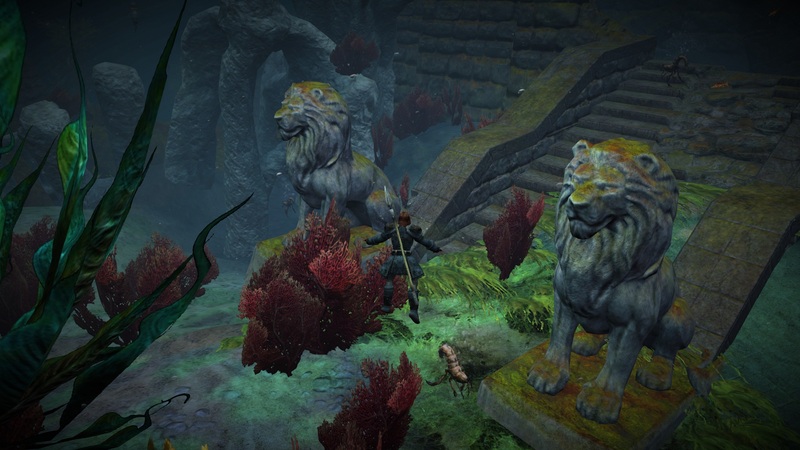 I’m unfamiliar with a lot of the lore from the original Guild Wars, but I do know that the present city of Lion’s Arch rests upon the watery grave of the former city. I had heard you could dive down into its massive harbor and see what remained of the ruins, so I decided to grab my breather and my spear and see for myself. Fans of the original game can probably pick out more distinct landmarks than I could, but even I had to pause and take note of the twin lions still keeping their silent vigil. Much like the architecture of the cities, Guild Wars 2 does an excellent job at realistically representing the passage of time. My brain knows that the ruins of Old Lion’s Arch are just a collection of art assets, but the attention to detail and the way it complements the lore gives the feeling of a real place that was once inhabited by heroes long dead. The new city reflects this as well. How do you rebuild a flooded city that is also a graveyard of hundreds of ships? How else? You use what you have on hand and incorporate the ships into the new structures! I respect and admire how logical that sort of thinking is, and how much consideration went into thinking about what real people would have done if confronted with that sort of catastrophe. 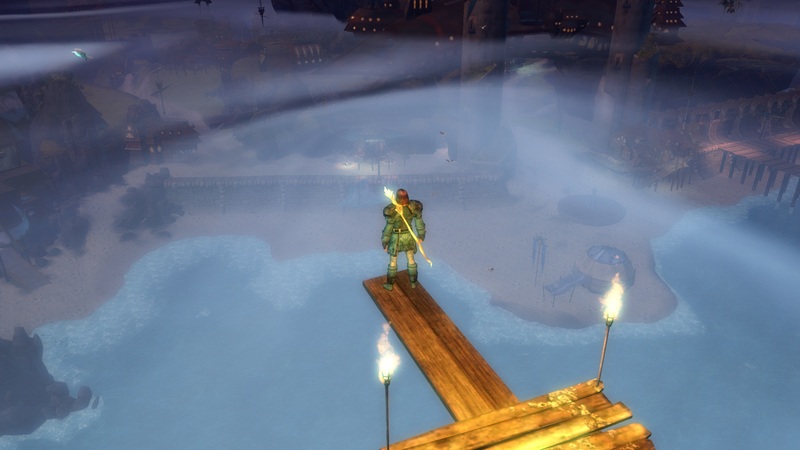 After coming up for air, I took a swim over to the diving board that I missed last time I visited Lion’s Arch. I love how fun and frivolous a detail this is for a city that is probably teeming with uncertainty, fear and doubt. As the only city that isn’t associated with one particular race, Lion’s Arch boasts the highest racial diversity of any other place on the map. Bringing together people from all corners of Tyria would mean bringing all of their prejudices as well. The city is run by a Captain’s Council comprised of naval veterans and privateers who were instrumental in carving out a city from the ruins and defending it against the undead minions of the Great Dragon Zhaitan. The threat of the dragon and the walking dead is ever present. It is only natural that a wise ruler would allow his people a means of relaxing and getting some enjoyment out of life. It’s a long drop off a short plank. I’m sure the humor in that isn’t lost on members of the Captain’s Council or the locals that call Lion’s Arch home. That is where I am standing in this shot. Even this doesn’t do justice to the scale. 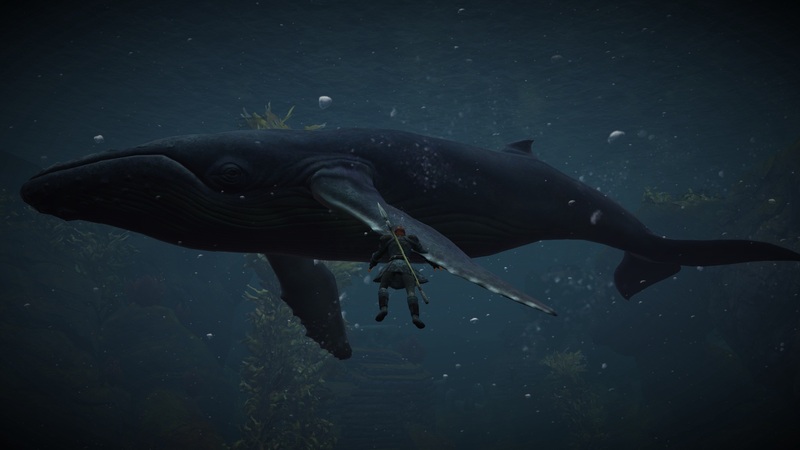 Guild Wars 2 is filled with unique places that beg you to find out what is over the next hill or swimming below the waves. After diving, I decided to see just how deep the harbor of Lion’s Arch was. After sinking down into darkness and kelp, I found this fellow who seemed just as surprised to see me. I could easily go on and talk about every area I visited, but I know I wouldn’t even scratch the surface of what there is to discover in Tyria. In every other MMO I’ve experienced, it was all about leveling as fast as I could in order to play the “real game” at max level. Some of them may have had decent stories; Star Wars: The Old Republic certainly has a stronger personal story than anything I’ve played through in Guild Wars 2 thus far. Other games, like World of Warcraft, may have impressive lore. The problem is that in each of those games, I never really felt a connection with the world around me. I could appreciate what they had to offer, but it was all just window dressing on my way to end game. With Guild Wars 2, playing the game IS the end game. If I want to just jump into structured PvP, I can do that without leveling. I can battle in World vs World from very early on in the game. If I want to backtrack and help a friend in an area that is lower level than I am, I still get a challenge and full experience reward thanks to downscaling. It just makes all other MMOs feel like they were on rails by comparison. The sense of freedom is as refreshing as it can be daunting at times. I’m so conditioned by hovering, yellow punctuation marks that I still catch myself wondering what to do next sometimes. What I finally realized is that what really sets Guild Wars 2 apart from other MMOs is that other MMOs tell you what you’re supposed to do. Guild Wars to asks you what you want to do.